The second half of 2013 was a thrilling event for those who invested their money in stock market making tremendous profit with this type of direct investments. Many have gone up and seen the rise of the Philippine Stock Exchange Index (PSEi) to 7,000 mark with people celebrating in sheer numbers to see their money grow. However, stocks have seen downside when profit taking took place in end of December 2013 days before Christmas time but surely I am optimistic about this and looking forward on a better this year 2014. Many people ask this question on how to invest in the stock market and why invest in the stock market? How much can a stock or equity profit? To answer all this questions for beginners who want to get into this type of investment vehicle, you must understand the basics of the stock market by reading first some resource materials that could easily be understood. There are tremendous resources now readily available about the Philippine stock market in which when I started out investment in 2008 there is none at all and are mostly written by foreign authors from the likes of Phil Town's Rule No. 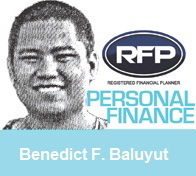 1 which I made a short review on this guy's book (link) and Technical Analysis of Stock Trends by Robert Edwards when I got invited in a free seminars from two leading online stock brokerage companies registered in the Philippine Stock Exchange. These books were recommended on those sessions to get a better glance and knowledge of the stock market then. The introductory to stock market in that one sunny afternoon of summer 2008 was helpful and a good way to learn indeed as I May 2008 report to August 2008 report till I bid farewell in April 2013 report on being bought my remaining shares out by Kirin Group and San Miguel Corporation. It took me a small step forward of the testing myself on how my money will work for me on my first investment with San Miguel Brewery's initial public offering (IPO) back in August 2008. Stock market is liquid, it can turn into profit within a day or so. It is easy to transact and trade but it requires fundamental and technical understanding before before buying or selling your shares from a listed companies. The objective of most investors is to buy from one of the Top 10 listed companies in the country and hold the investment till it goes to peak for profit taking meaning to sell the shares when the timing is right for the picking. 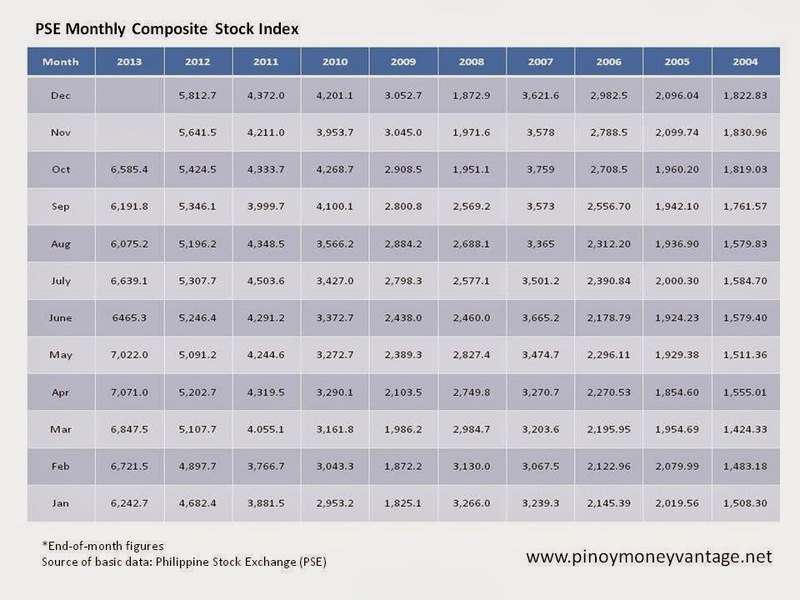 In the figures listed below, it shows how the Philippine Stock Market Composite Index kept rising for the past few years starting from 2004 to 2013. Note: PSEi end-of-month figures for November and December 2013 are not available. 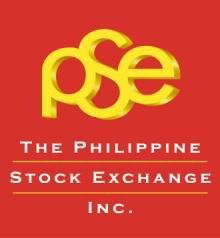 There are several registered Philippine stock brokerage companies or trading participants in the Philippine Stock Exchange. All are Securities and Exchange Commission (SEC) registered companies in the country as well. You can choose from several of them (see directory). If you wish to trade online, there are online stock trading companies engage in this type of stock trading platform which more convenient for the likes of us working people with busy schedule in the office on a 9 to 5 shift. Investing on the stock market requires initial investment or cash to engage and use their services. For more details you can check out the online stock trading companies listed for the complete guide on where to put your cash on their initial investment. 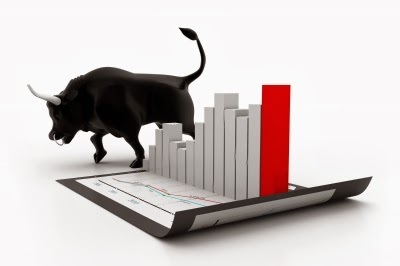 There is a big difference between online traders and traditional securities / trading companies. How much can a stock or equity profit? Shares of stock can earn up to 1 to 3% per day against a 0.5% to 1.0% per annum from a bank savings account from a commercial savings banks. You can see the big difference in gaining profit from these investments. There is one general rule in engaging in the Stock Market which is "Buy Low, Sell High".Stock Market is not for the faint-hearted and for unemotional intelligent risk-taking individuals only. I have seen tremendous leaps and bounds on the stock market with many ordinary Filipinos engaging on this type of passive investments with several Filipino authors who come to educate us and have made books on investing acclimated to the Philippine Stock Market and also some other free resource sites available about Philippine Stock Market investing nowadays. Will be writing more on Investing in Stocks on the next articles.